Interior-scapes are making a resurgence …. so for sustainable interest and designer ‘pop’, what could you be looking for far beyond the humble pot plant .. ? The exciting truth Peeps is found among many planting outcomes now required for a realistic match to growing conditions, of inside/outside interfaces in commercial and residential settings. 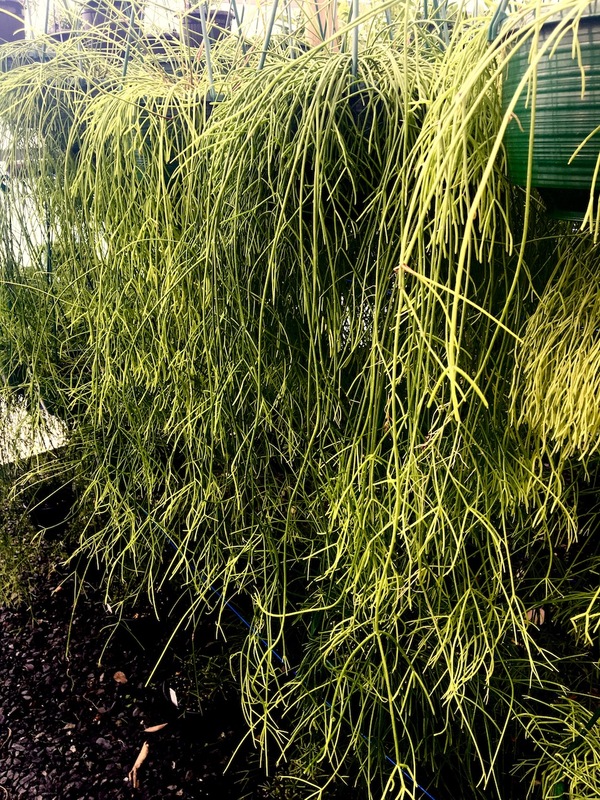 Head and shoulders above most options is the diverse epiphytic genus Rhipsalis or Mistletoe Cactus mostly from Brazil. 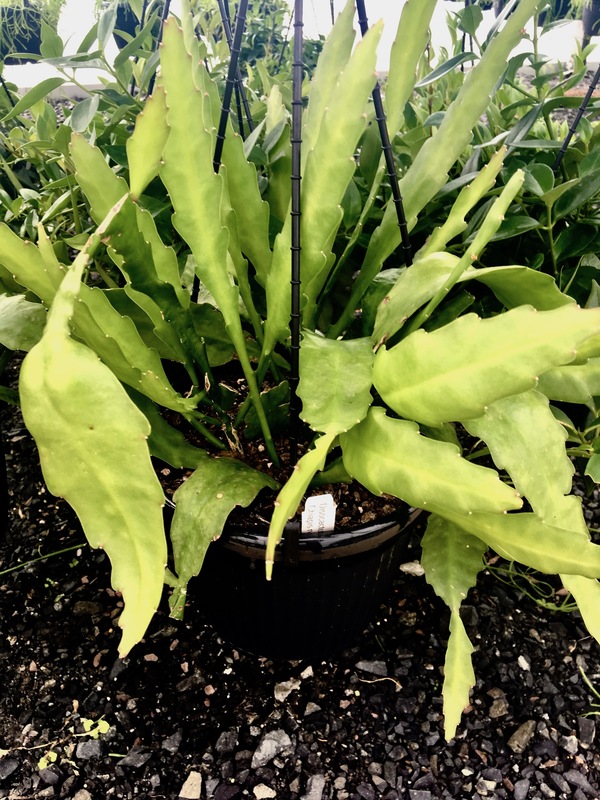 Textural wreaths, greenwalls, eco pillows, horizontal green-bands, vertical green-blades, green-roofs & pseudo-greenwalls have all exceeded the basic hanging basket, as a catch-all destination for these fascinating plants. Leading among an enthusiastic band of visionary growers, is Justine Smith at Peats Ridge on NSW Central Coast. While there will be an impressive stall space at Plant Lovers Fair Kariong come 22nd & 23rd September, contract growing is preferred. Among many garden making outcomes for these plants are more sheltered growing spaces like courtyards. Fast draining medium levels can be raised as ‘planting humps’ to separate wet sensitive root fibre from the cold winter ground. 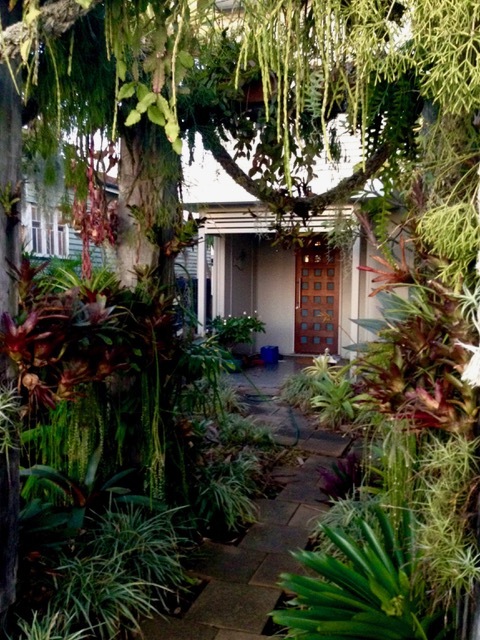 Lush sense of arrival is assured for the front door and epiphytes combine very convincingly with small palms, aroids, ferns and bromeliads. 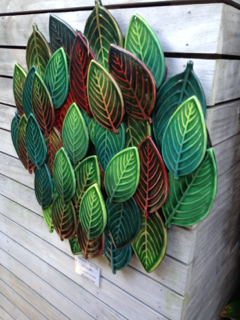 Kevin Kilsby for years been associated with beautiful ceramics in New Zealand, as homewares and for use as art in the garden. A visit there last month with Garden Photographer Gil Hanly, revealed a lot more than Kevin’s home studio and showroom. Adjacent garden space has evolved into a jewel box cornucopia of horticultural delights, blended with his own glossy ceramic treasures FOR YOUR GARDEN OR OTHERS. Catching the eye on entry is a patio wall encrusted with mini neo’s and orchids and a nearby ceramic leaf wreath.